There are many different reasons why you may be losing hair and it can be frustrating, confusing and just downright annoying if you can’t get to the bottom of why it might be happening. To help you think of all angle when it comes to seeing why you might be losing your hair, I have created you the following list of the most common causes of hair loss. It will help you see which causes of hair loss might apply in your case and give you a few others that you may not of thought of as being a potential problem. You also have to remember that your hair is constantly changing and going through different cycles of growth, resting, shedding. It is usually only when hairs that are lost naturally are not replaced with new ones that your hair loss becomes noticeable. It could also be that more of your hair is in a “resting” phase than it should be. Because there are so many reasons why you might be having hair issues, the short list below will highlight many of the common factors that contribute to hair loss in men and women. This is a fairly obvious one, but the normal time frame for hair loss from older age is actually when you are between 20-50 years old. Unfortunately, some people can enter this stage of hair loss a lot sooner than others. However, as you might expect, it is more common in older people, where the healthy follicles being to die off and no new hairs are grown to replace those that have fallen out. Most shampoo, conditioners, hair treatments and colors contain very powerful chemical ingredients that are not great for your hair or your scalp. Although they are good for keeping your hair clean, extended use over time can cause dry or brittle hair and a dry scalp. These problems can cause the scalp to not allow any new hair growth. Try using products with as many natural ingredients in as possible and read our article where we have reviewed the best shampoo for hair growth. There are many side effects to a lot of drugs or medications that people take and hair loss can be one of them. It is especially present for people who are getting cancer treatments or if you are taking anti-depressants or hormone type drugs. If this might be an issue, speak to your doctor who can advise you. Usually found in men and known as “male pattern baldness” Androgenetic Alopecia is the name for the genetic predisposition in men (or women) to hair loss. Unfortunately, some people get it and other don’t – it just depends on the family history. A lot of “processes” in your body are regulated by your hormones and if your hormones are out of balance for any reason, then you might experience hair loss as a result. Similarly to hormonal problems, an overactive or under-active thyroid gland can contribute to hair loss. This is due to the balance of your body being incorrect, causing less growth of new hairs. Our hair always looks lank and horrid when we are ill and it can be a good mirror of how we feel inside. Other illnesses that can affect hair growth are things like scalp fungal infections or diabetes. If you suspect that you might be losing hair for a reason related to being ill or having some sort of infection, see your doctor immediately. Alopecia Areata is a disorder of the immune system causing your scalp and hair follicles to stop growing any new hairs. Alopecia can cause small patches of hair to stop growing. This is quite a common issue, although you might be more familiar with Alopecia Totalis when all of the hair on you head disappears or Alopecia Universalis where all of your body hair is lost. Due to hormonal changes after the menopause, many women begin to experience hair loss. 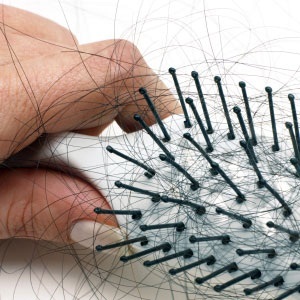 This can be a main cause of hair loss in women although drugs and treatments like HRT (hormone replacement therapy) can help reverse this problem. Your scalp needs to be very healthy to promote hair growth and problems related to poor blood flow can contribute to hair loss. Around 3 to 6 months after having a baby, many women may notice an amount of hair loss. This is because the hair goes moves into a resting phase, mainly due to the physical impact of the pregnancy on the body. If you have hair styles such as braiding or pony tails, the hair becomes pulled all the time, leading to hair loss (known as Traction Alopecia). You might also see this kind of Alopecia from not using curling tongs or rollers properly, so that the hair becomes weak and damaged at the root. You have probably heard the saying where someone has “lost their hair overnight” or where a sudden shock has lead to people’s hair going white. Actually, although this sounds like something from a story book, Telogen Effluvium is the term used to describe the slowing down or stopping of new hair growth due to sudden or severe emotional stress. The stress can trigger a large amount of your hair follicles to swap from the “growing stage” to the “resting stage”. Therefore, after you have experienced the stressful event the hair will eventually start to die off and fall out. This is just a very small list of the possibilities for you hair loss and it is definitely not complete. The causes of hair loss can be a complicated problem to unravel, but this list describes the most popular issues.